Each year, Humphrey community residents take part in surveys to provide valuable feedback on their resident experiences. Surveys include questions about leasing office responsiveness, maintenance technician work quality and professionalism, and the cleanliness of the apartment homes & community. This year, 80% of Humphrey resident survey responders stated that they were “Very Likely to Renew” their lease, while 90% would recommend their community to a friend. This is the 3rd year running that residents have rated their experience as Superior or Exceptional on their surveys. 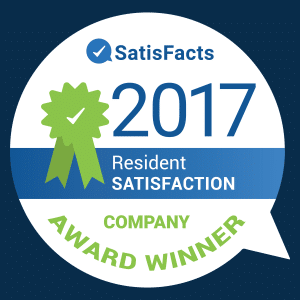 We are also proud to recognize 13 communities for receiving individual 2017 Resident Satisfaction awards: Bay Forest, Burgess Mill Station, Cascades Village, Chapel Springs, Cottages of Shippensburg, Evergreen Senior, Glen Forest, Hampshire Village, Perryman Station, River Point Senior, The Bonifant at Silver Spring, The Bradford, and Village House. Congratulations to all of our winners!